Updated 12-1-18. Completing Notary certificate wording is an essential part of your duties, but it's easy to get confused and make mistakes when doing so. Here is a guide to the 4 main parts of Notary certificate wording and what information goes in each of them. The venue refers to where the notarization takes place. The venue establishes the qualifications and authority of the Notary or notarizing officer performing the notarial act. 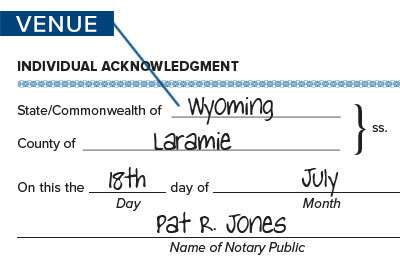 Usually, the Notary is asked to write the name of the county and state in the appropriate blanks. However, some venue forms require the Notary to write in different location information, for example the city and state. You may occasionally encounter documents that have the venue already filled in. Make sure it reflects the true location. If it does not, you’ll need to correct the certificate. The body includes the main information about the notarial act, including the name of the signer, the date of notarization, and important details about the notarial act itself. There is always a space for you to sign. You should sign your name exactly as it appears on your Notary commission. 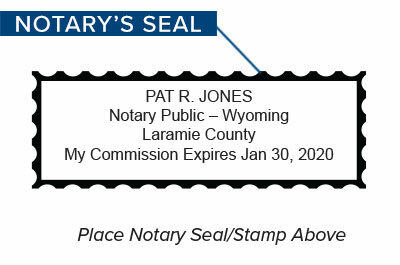 While not all states require Notaries to have a seal or stamp, most do. Placing the seal on a notarial certificate “authenticates” or establishes the genuineness of the notarial act. Typically, you will affix your seal next to your signature. Make sure it is clear and legible. The wording on Notary certificates varies from state to state. Some states prescribe the exact wording while others require you to use a certificate that substantially complies with the statutory form. Whatever the requirements, you’ll see these elements. You can learn about Notary certificate wording for your state from your state's Notary regulating agency website or your state’s Notary handbook. Or check out the NNA’s Notary Primers or U.S. Notary Reference Manual, which is a NNA member benefit. The NNA’s Notary Essentials eLearning course guides you through all your state's requirements. How do I go about being a notary? Thank you. Hello Arnissa. You will need to apply for a commission from your state's Notary regulating agency. Depending on what state you are in, you may also need to meet other requirements, such as taking a class or passing an exam. Our Customer Care team can assist you with the commissioning process if you wish-for assistance, please visit www.NationalNotary.org or call 1-800-876-6827. Please let us know here if we can help answer any other questions. Good luck! I have passed the exam almost 2 years ago and received all my legal paraphernalia. However, I have never used anything because I have no idea how to really do this. Is there an actual video that walks us through the process, at least for the first time? It's great to read all your information however, actually doing it is another thing. Also, on loan docs, is each signature on each page a charge, or is the entire packet one price? A class is offered for this but wondering if worth taking. Thanks for any info. Hello. If you are a new Notary and unfamiliar with the process, the NNA offers training classes that you may find helpful (www.NationalNotary.org). Also, the following videos may be helpful to you: How To Administer Oaths and Affirmations (https://www.nationalnotary.org/knowledge-center/news/webinars/commonly-asked-questions/how-to-administer-oaths-and-affirmations) and 10 Steps To A Flawless Loan Signing (https://www.nationalnotary.org/knowledge-center/news/webinars/signing-agent/10-steps-to-flawless-loan-signing). I am employed by a civil engineering firm in Utah which require a notary public. I'm going to take the Utah notary test soon. However, I found a document with the notarial language they want included on the documents. One is a jurat for the signer to sign in the presence of the notary. The other is an acknowledgement when the signer is not going to be in the presence of the notary. I understand the either types, jurat or acknowledge, the signer must be personally present in front of the notary. Is that correct or not. Thank you. Hello. 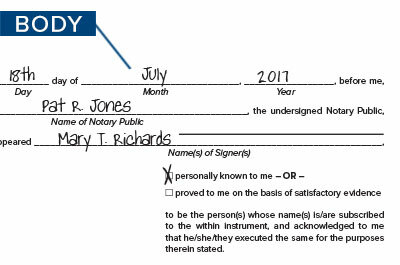 For an acknowledgment, the signer does not have to sign the document in the Notary's presence. However, the signer must physically appear in person before the Notary with the signed document to be identified and acknowledge the signature. For a jurat, the signer must both sign in the Notary's presence and then take an oath or affirmation of truthfulness administered by the Notary. I respectfully disagree with Part 3 of your article that refers to the notary signature. 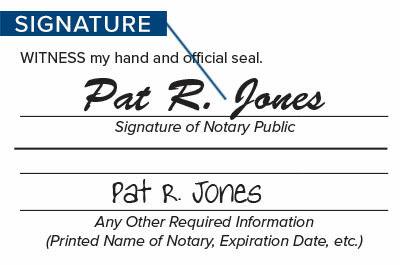 There is NOT always room for a notary's signature. I've completed dozens of notaries in which I've had to affix a separate document to their original because there was not enough room to place my signature and/or seal. Disappointed that link to 'Correct the Certificate' actually leads to 'Avoid Incorrect Certificate' without direction how to correct mistakes. Any chance for updated link? We've updated the link. Thanks for letting us know! Q. I am a notary for state of Oklahoma, Adair Co. If I notarize a document in a different county do I write the county I am in or Adair Co.
Hello. You would write the county where the notarization took place in the venue portion of the Notary certificate wording. Is it legal for the notary to read the contents of document or just make sure all the required areas of notary public signitures are in order to notarize? Hello. The Notary should not read the document in detail, but should look over the document to make sure it has the correct notarial wording and to ensure there are no blank spaces or other issues that would prevent notarization. What if it's an acknowledgement, and the Notary certificate wording does not include a venue portion? Do I HAVE to add in the state and county on my own, or can I notarize the acknowledgment? That depends on your state's laws regarding acknowledgment wording. What state are you commissioned in? Could you please put all of the components of the acknowledgement together into one complete dicument so I can duplicate it for a deposition transcript, please. I'm new as well to the notary I believe all the information I have received is my class. I paid for it so I'm assuming this is it. An effective trick I use do double check my work, is counting to five. 1) correct venue, 2) correct date, 3) signer's name, 4) my signature, and 5) my seal. This satisfies Illinois' requirements. Combined with using the 4 part system to verify the notarial certificate is correct before notarizing and making sure you can "count to five" after the notarization (before leaving for loan signings!) has helped catch my mistakes immediately and keeps clients happy. how much do we charge for copy certification in state of california. Is it 15.00 dollars for the notary or can we charge anything extra. Hello. CA Notaries may only certify copies of a power of attorney, or copies of their own journal entries if ordered to provide certified journal entry copies by the Secretary of State or a court of law. The maximum fee for certifying a copy of a power of attorney is $15 (GC 8211[e]).